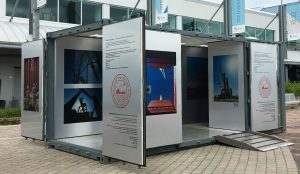 In 2007, Sodes produced an exhibition featuring art photos of marine infrastructures. Developed by SODES and designed by EXMURO arts publics, this exhibition illustrates various facets of the marine industry, revealing many of its infrastructures to the public in a new light. 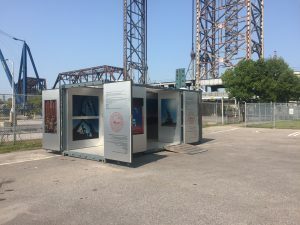 Set up in a shipping container–like those used to transport everyday consumer items and products delivered by ship–reworked into an art gallery, this travelling exhibition visit many St. Lawrence waterfront cities over the summer since 2017. Its presence at various events allowed a wide-ranging public to be reached in order to make the marine sector known.